Poor Rosencrantz and Guildenstern. If you’re familiar with Shakespearian tragedies, you’ll recognize these two characters as supporting players in Hamlet and their unfortunate demise. Fells Point Corner Theatre’s latest production, Rosencrantz and Guildenstern are Dead by Tom Stoppard, Directed by Lance Bankerd, takes a peek between the lines of the Shakespeare classic to gives us a theoretical peek into what these two ill-fated characters were up to in the background while our friend Hamlet was going crazy. I’m usually a big fan of stories that include telling more in depth, parallel stories about minor or supporting characters of established stories. It’s always interesting to see and hear what’s going on in the background of other stories, and they are usually quite creative and imaginative. So, not knowing much about this title, but being familiar with Shakespeare’s Hamlet, I was excited to see what could transpire. I was excited. Then I realized this is Absurdist theatre. Admittedly, I am not a fan of Absurdist theatre and, after five minutes of rambling dialogue about probabilities and odds, I was turned off. The actors were doing a magnificent job, but the dialogue left me cold. The text is ostentatious and the fast pace of dialogue seems to me that the author is trying to create a character who’s mind works so fast he or she has to get out all the words before the next bright idea comes along. Ugh. Also, this doesn’t seem to be a stand-alone piece (as other titles are, this isn’t the only one) and one must have a familiarity with Hamlet before seeing this piece. There is an attempt to keep the audience up to pace with the introduction of certain characters and light explanations, but it’s half-hearted, at best. However, Stoppard does keeps true to the action of Hamlet, but when it comes to these two characters (and company), you can keep ‘em… but that’s just me. No matter my feelings of the script, there’s absolutely no denying the fabulous production value Fells Point Corner Theatre gives us. Lance Bankerd, who takes the helm of this production, has a clear vision and tells the story straight-forward, with simple staging but superb character work. He seems to have a tight grasp on the tedious material and presents it in a laidback, easy-to-follow way making for a delightful showing. Also, it’s worth mentioning the creative Costume Design by Deana Fisher Brill and Maggie Flanigan who have managed to find and gather more denim in one place than I’ve seen since house party in the 90s. Their design compliments the piece and is consistent which makes it a praise-worthy design. Moving on to the performance aspect of this production, I’d be amiss if I didn’t mention the effort and dedication this entire ensemble puts into this production and their work pays off, nicely. Though most of the ensemble seemed like fillers, all gave beautiful performances such as Elizabeth Ung as Ophelia, who didn’t have much stage time, but made the most of what she had and Michael Panzarotto and Rory Kennison, who took on the roles of The Tragedians Horatio and Alfred, respectively. Panzarotto and Kennison didn’t have many lines, but they certainly played their characters to the hilt, physically, with appropriate gestures, mannerisms, and impeccable reactions to the other happenings on the stage. Dominic Gladden takes on the role of Hamlet, who actually isn’t the main character in this particular story, but Gladden played the role effortlessly. It’s hard to make out his dialogue, at times, through a heavy dialect, but he has a good comprehension of the twisted character and plays him with confidence giving a strong performance. 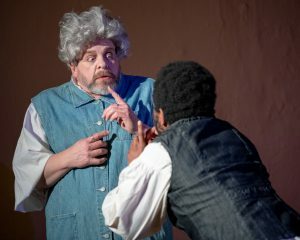 In step with the freaky family, Tom Piccin tackled the role of Claudius, the conniving uncle to Hamlet, and Kay-Megan Washington portrays Gertrude, the award-winner for Worst Mother of the Year. Both Piccin and Washington know these characters well and they have a good chemistry to play well off of and with each other. Both are quite able actors and they shine through the supporting roles to give brilliant performances. 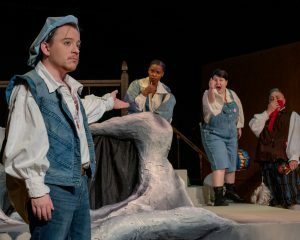 There are certainly highlights in this production, including Bethany Mayo as The Player, the leader of a passing troupe of actors, and a little bit of a con artist. She has this role down pat and her comedic timing, as well as understanding of dramatics is crystal clear. She is comfortable in the role and plays it with ease, making for a solid and robust portrayal. Thom Sinn as Polonius, the hapless, disheveled advisor to Claudius, is also a highlight mainly because of his comedic timing. His take on this character is spot on. Playing Polonius as more of a bumbling assistant, Sinn makes this character likeable and you start rooting for him, but you don’t why, you just know you want everything to work out for this poor fool. His delivery is a bit mushed at first, but that could be what Sinn is going for as it would fit with the character, but otherwise, his performance is strong and confident, making for a charming character. Rounding out the cast is the truly remarkable Logan Davidson as Rosencrantz and Matt Wetzel as Guildenstern, who are the standouts in this production and they are working their asses off on that stage. Rosencrantz and Guildenstern, in the Shakespeare play, are friends of Hamlet, but are assigned by Claudius to take Hamlet to England with a letter to the King of England asking him to kill Hamlet, unbeknownst to the duo. Hamlet finds out, and, well… let’s just say things don’t turn out so well for Rosencrantz and Guildenstern. You read the title already. Davidson and Wetzel have a fantastic chemistry and work well off of each other, and, a little birdy told me they learned this hefty script in a little over a month, which is impressive with the amount of dialogue these two have to deliver throughout the show. They’re physical work is also spot on and they keep the audience engaged and entertained. Wetzel has a natural flair in his delivery and precise mannerisms that make him a joy to watch. Davidson, too, has a knack for the physical and portrays her role (whether it be Rosencrantz or Guildenstern, depending on what’s happening on stage at the time) with confidence and ease. Both of these actors have a tight grasp on their characters and play them solidly. Their effort is apparent, and they deserve the utmost kudos for their work on this production. They are certainly ones to watch. Final thought… Rosencrantz and Guildenstern are Dead, is a polished, beautifully performed, well-thought out production but it’s not one I’d be running to see if it comes around again. Many folks love this kind of stuff, but absurdist theatre is just not my cup of tea, as it were, and the script is a little too pretentious for my tastes. However, Tom Stoppard’s pretentious “look-how-smart-I-am” script and dialogue aside, this is a splendid production. The ensemble is giving 100% effort in their superb performances and Bankerd’s staging is spot on, creating a smooth flow that keeps it engaging and entertaining. It’s definitely a praise-worthy production that deserves checking out. 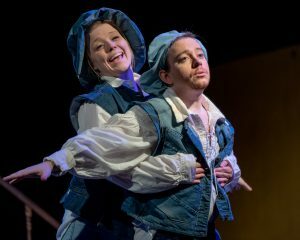 This is what I thought of this production of Rosencrantz and Guildenstern are Dead at Fells Point Corner Theatre.… what do you think? Rosencrantz and Guildenstern are Dead will play through May 5 at Fells Point Corner Theatre, 251 S Ann Street, Baltimore, MD 21231. For tickets, call 410-276-7837 or purchase them online. Like Backstage Baltimore on Facebook, and follow us on Twitter and Instagram!